How is the Finance Industry Utilising Emerging Technologies? Mobile and online banking apps have now become a part of everyday life, but there are more advanced technology trends being adopted by the financial industry. 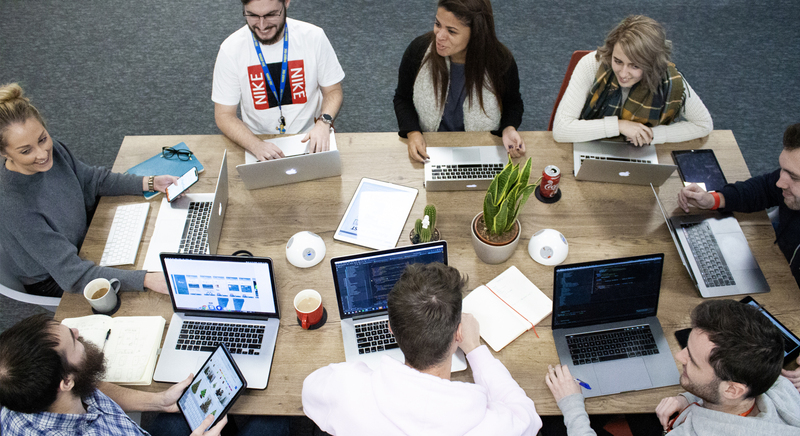 Businesses are starting to experiment with emerging technology such as AI, Augmented Reality, Voice Technology and Virtual reality in order to be at the forefront of innovation and improve business processes. Virtual Reality holds huge potential within the finance sector, from creating virtual banks to allow customers to manage their finances within a virtual environment. It is allowing financial organisations to rethink the way they are presenting their products and services. In 2017, BNP Paribas, the French international banking group created a virtual reality app allowing retail banking users to access their account activity and transaction records in a VR environment. The aim of the app also allowed BNP Paribas to explain complex products such as investment or insurance solutions in a tangible way, making it easier to describe each product. The impact of artificial intelligence is being seen across a number of industries, the finance sector, in particular has seen many businesses use the technology to better the service they offer its customers. From using AI to make better sense of financial data to creating AI-driven digital assistants. 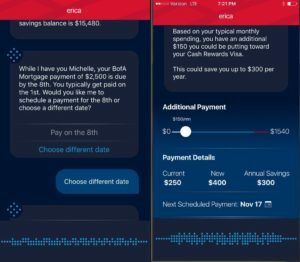 The Bank of America, for example, used the power of AI to create ‘Erica’, an AI-powered, voice-activated virtual assistant. The mobile assistant combines AI, predictive analysis, and natural language processing to interact with clients in a number of situations. The Bank of America reported that Erica just surpassed one million users, and is being used daily to search for transactions, check their balance and credit score, and find their bills and account numbers. Not only is this technology helping the customer, it also provides data for the bank on the customer’s behaviour. When a customer interacts with the bank via Erica, they leave behind a footprint of financial data that the AI technology reads and digests to offer useful advice to the customer and allows the bank to offer real-time opportunities and relevant products to them. As voice technology continues to rapidly grow across all markets, developments are being adopted in an attempt to transform the financial industry. Many banks are working in partnership with Voice Assistant leaders such as Alexa, Google Home and Siri to provide instant information about a customer’s banking requests. American Express, in particular, worked with Amazon to launch the ‘Amex Skill’, which makes uses of features on AmericanExpress.com. When consumers link their online American Express account, those with Alexa-enabled devices can check their account balance, review recent charges, make a payment and more through voice commands. Luke Gebb, senior vice president, said “Our Card Members are redefining how they engage with our brand across the digital platforms of their choice, and we want them to have great experiences wherever they are.” Providing added value to their customers and keeping them engaged with the brand. Currently, there are many technology executives within the financial industry, trying to integrate many of these technologies into their services. While there is still some time before emerging technologies such as AR and VR truly take hold in many industries, including finance, it is clear they are already starting to make an impact.